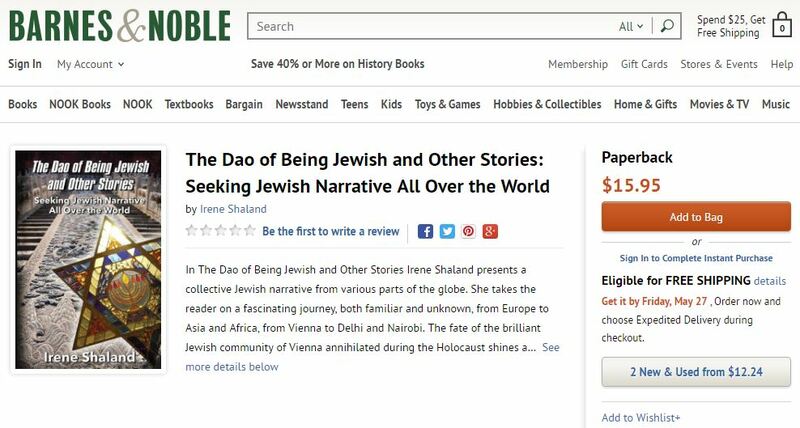 Irene Shaland’s latest book “The Dao of Being Jewish and Other Stories” is now available at Barnes & Noble. Go to Barnes & Noble online Store. In “The Dao of Being Jewish and Other Stories” Irene Shaland presents a collective Jewish narrative from various parts of the globe. She takes the reader on a fascinating journey, both familiar and unknown, from Europe to Asia and Africa, from Vienna to Delhi and Nairobi. The fate of the brilliant Jewish community of Vienna annihilated during the Holocaust shines a disturbing light on the stories of the current rise of Antisemitism in Scandinavia and throughout Europe. Two-millennium old tales of little-known Jewish communities of India and China, who never knew religious persecution, reveal happy chapters in the history of Jewish Diaspora filled with so many tragic events. And striking stories of the uplifting revival of Judaism in Sicily and Sardinia after 500 years of the expulsion of the Jews from these islands give us hope for a more harmonious future. Based on the author’s interviews during her travels to ten countries and three continents, this book is Irene Shaland’s passionate quest to preserve the Jewish heritage, identity, memory, and history. This entry was posted in Europe, General, History, Holocaust, Jewish Story, Religion and tagged author, book, Europe history, history, Holocaust, Irene Shaland, The Dao of Being Jewish. Bookmark the permalink.